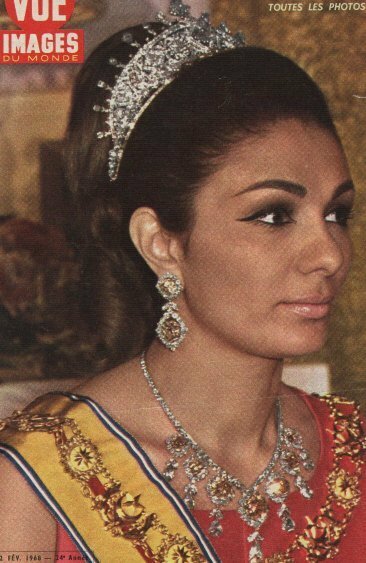 Farah Pahlavi (Persian: فرح پهلوی‎, née Farah Diba Persian: فرح دیبا‎; born 14 October 1938) is the widow of Mohammad Reza Pahlavi and the former shahbanu (empress) of Iran. Farah Diba was born on 14 October 1938 in Tehran to an upper-class family. Born as Farah Diba, she was the only child of Captain Sohrab Diba (1899–1948) and his wife, Farideh Ghotbi (1920–2000). Farah's father's family is of Iranian Azerbaijani origin. In her memoir, the former Shahbanu writes that her father's family were natives of Iranian Azerbaijan while her mother's family were of Gilak origin, from Lahijan on the Iranian coast of the Caspian Sea. Through her father, Farah came from a relatively affluent background. In the late 19th century her grandfather had been an accomplished diplomat, serving as the Persian Ambassador to the Romanov Court in St. Petersburg, Russia. Her own father was an officer in the Imperial Iranian Armed Forces and a graduate of the prestigious French Military Academy at St. Cyr. Farah wrote in her memoir that she had a close bond with her father, and his unexpected death in 1948 deeply affected her. The young family was in a difficult financial state. In these reduced circumstances, they were forced to move from their large family villa in northern Tehran into a shared apartment with one of Farideh Ghotbi's brothers. 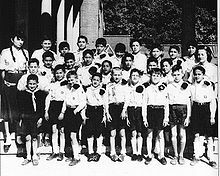 The young Farah Diba began her education at Tehran's Italian School, then moved to the French Jeanne d'Arc School until the age of sixteen and later to the Lycée Razi. She was an accomplished athlete in her youth and became captain of her school's basketball team. Upon finishing her studies at the Lycée Razi, she pursued an interest in architecture at the École Spéciale d'Architecture in Paris, where she was a student of Albert Besson. Many Iranian students who were studying abroad at this time were dependent on State sponsorship. 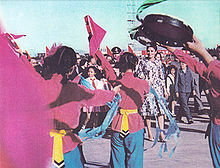 Therefore, when the Shah, as head of state, made official visits to foreign countries, he frequently met with a selection of local Iranian students. It was during such a meeting in 1959 at the Iranian Embassy in Paris that Farah Diba was first presented to Mohammed Reza Pahlavi. After returning to Tehran in the summer of 1959, the Shah and Farah Diba began a carefully choreographed courtship, orchestrated in part by the Shah's daughter Princess Shahnaz. The couple announced their engagement on 23 November 1959. Farah Diba married Shah Mohammed Reza on 20 December 1959, aged 21. The young Queen of Iran (as she was styled at the time) was the object of much curiosity and her wedding received worldwide press attention. Her gown was designed by Yves Saint Laurent, then a designer at the house of Dior, and she wore the newly commissioned Noor-ol-Ain Diamond tiara. After the pomp and celebrations associated with the imperial wedding, the success of this union became contingent upon the queen's ability to produce a male heir. Although he had been married twice before, the Shah's previous marriages had given him only a daughter who, under agnatic primogeniture, could not inherit the throne. The pressure for the young queen was acute. The shah himself was deeply anxious to have a male heir as were the members of his government. Furthermore, it was known that the dissolution of the Shah's previous marriage to Queen Soraya had been due to her infertility. Shahbanu Farah at work in her office in Tehran, 1970s. The exact role the new queen would play, if any, in public or government affairs, was uncertain with her main role being simply to give the Shah a male heir. Within the Imperial Household, her public function was secondary to the far more pressing matter of assuring the succession. However, after the birth of the Crown Prince, the Queen was free to devote more of her time to other activities and official pursuits. Mohammad Reza was always very attracted to tall women and Farah was taller than her husband, which led him to wear elevator shoes to disguise this fact. 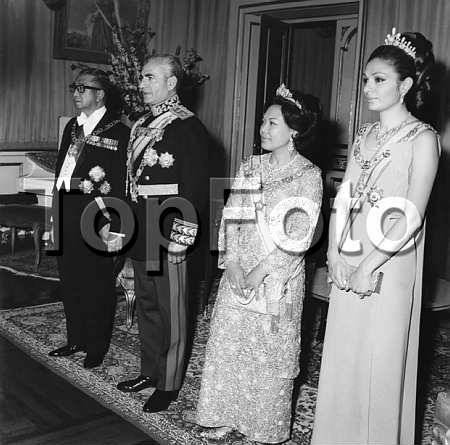 Usually when the Imperial couple were photographed, one or both would be sitting in a chair or alternatively the Shah and his wife were photographed on a staircase with Mohammad Reza standing on the upper stairs. 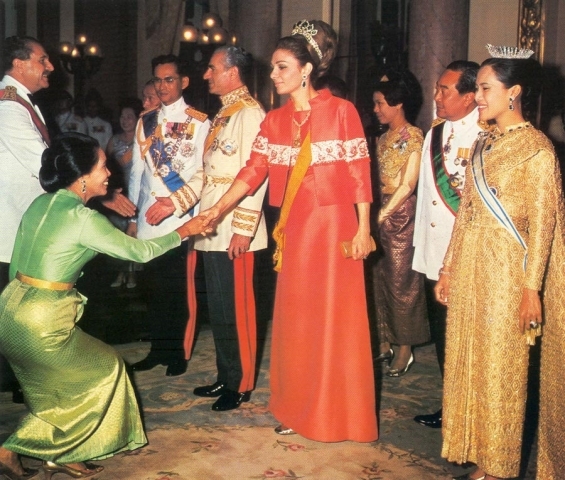 Like many other royal consorts, the Queen initially limited herself to a ceremonial role. In 1961 during a visit to France, the Francophile Farah befriended the French culture minister André Malraux, leading her to arrange the exchange of cultural artifacts between French and Iranian art galleries and museums, a lively trade that continued until the Islamic revolution of 1979. Farah and Mohammad Reza usually spoke French rather than Farsi to their children. She spent much of her time attending the openings of various education and health-care institutions without venturing too deeply into controversial issues. However, as time progressed, this position changed. The Queen became much more actively involved in government affairs where it concerned issues and causes that interested her. She used her proximity and influence with her husband, the Shah, to secure funding and focus attention on causes, particularly in the areas of women's rights and cultural development. Farah's concerns were the "realms of education, health, culture and social matters" with politics being excluded from her purview. However, Mohammad Reza's politically powerful twin sister Princess Ashraf came to see Farah as a rival. It was the rivalry with Princess Ashraf that led Farah to press her husband into reducing her influence at the Court. I could not write in detail of all the organizations over which I preside and in which I take a very active part, in the realms of education, health, culture and social matters. It would need a further book. A simple list would perhaps give some idea: the Organization for Family Well Being-nurseries for the children of working mothers, teaching women and girls to read, professional training, family planning; the Organization for Blood Transfusion; the Organization for the Fight Against Cancer; the Organization for Help to the Needy, the Health Organization ... the Children's Centre; the Centre for the Intellectual Development of Children ... the Imperial Institute of Philosophy; the Foundation for Iranian Culture; the Festival of Shiraz, the Tehran Cinema Festival; the Iranian Folklore Organization; the Asiatic Institute; the Civilisations Discussion Centre; the Pahlavi University; the Academy of Sciences. 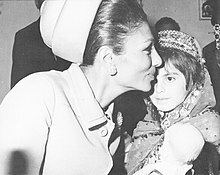 Shahbanu Farah visiting an orphanage. As a former architecture student, the Empress's appreciation of it is demonstrated in the Royal Palace of Niavaran, designed by Mohsen Foroughi, and completed in 1968: it mixes traditional Iranian architecture with 1960's contemporary design. Nearby is the personal library of the Empress, consisting of 22,000 books, comprising principally works on Western and Eastern art, philosophy and religion; the interior was designed by Aziz Farmanfarmayan. Historically a culturally rich country, the Iran of the 1960s had little to show for it. Many of the great artistic treasures produced during its 2,500-year history had found their way into the hands of foreign museums and private collections. It became one of the Empress's principal goals to procure for Iran an appropriate collection of its own historic artifacts. To that end, she secured from her husband's government permission and funds to "buy back" a wide selection of Iranian artifacts from foreign and domestic collections. This was achieved with the help of the brothers Houshang and Mehdi Mahboubian, the most prominent Iranian antiquities dealers of the era, who advised the Empress from 1972 to 1978. With these artifacts she founded several national museums (many of which still survive to this day) and began an Iranian version of the National Trust. Museums and cultural centres created under her guidance include the Negarestan Cultural Center, the Reza Abbasi Museum, the Khorramabad Museum with its valuable collection of Lorestān bronzes, the National Carpet Gallery and the Glassware and Ceramic Museum of Iran. Aside from building a collection of historic Iranian artifacts, the Empress also expressed interest in acquiring contemporary Western and Iranian art. To this end, she put her significant patronage behind the Tehran Museum of Contemporary Art. The fruits of her work in founding and expanding that institution are perhaps the Empress' most enduring cultural legacy to the people of Iran. Using funds allocated from the Government, the Empress took advantage of a somewhat depressed art market of the 1970s to purchase several important works of Western art. Under her guidance, the Museum acquired nearly 150 works by such artists as Pablo Picasso, Claude Monet, George Grosz, Andy Warhol, Jackson Pollock, and Roy Lichtenstein. Today, the collection of the Tehran Museum of Contemporary Art is widely considered to be one of the most significant outside Europe and the United States. According to Parviz Tanavoli, a modern Iranian sculptor and a former Cultural Adviser to the Empress, that the impressive collection was amassed for "tens, not hundreds, of millions of dollars". Today, the value of these holdings are conservatively estimated to be near US$2.8 billion. Discontent within the country continued to escalate and later in the year led to demonstrations against the monarchy. Pahlavi wrote in her memoirs that during this time "there was an increasingly palpable sense of unease". Under these circumstances most of the Shahbanu's official activities were cancelled due to concerns for her safety. The question of where the Shah and Shahbanu would go after leaving Iran was the subject of some debate, even between the monarch and his advisers. 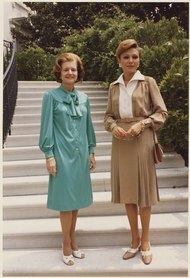 During his reign, Mohammad Reza had maintained close relations with Egyptian President Anwar Sadat and Farah had developed a close friendship with the President's wife, Jehan Sadat. The Egyptian President extended an invitation to the Imperial Couple for asylum in Egypt which they accepted. Due to the political situation unfolding in Iran, many governments, including those which had been on friendly terms with the Iranian Monarchy prior to the revolution, saw the Shah's presence within their borders as a liability. The Revolutionary Government in Iran had ordered the arrest (and later death) of both the Shah and the Shahbanu. The new Iranian Government would go on to vehemently demand their extradition a number of times but the extent to which it would act in pressuring foreign powers for the deposed monarch's return (and presumably that of the Empress) was at that time unknown. The Imperial couple were aware of the potential danger which their presence carried to their hosts. In response, they left Egypt, beginning a fourteen-month long search for permanent asylum and a journey which took them through many countries. After Egypt, they traveled to Morocco, where they were briefly the guests of King Hassan II. After leaving Morocco, the Shah and Empress were granted temporary refuge in the Bahamas. After their Bahamian visas expired and were not renewed, they made an appeal to Mexico, which was granted, and rented a villa in Cuernavaca near Mexico City. After leaving Egypt the Shah's health began a rapid decline due to a long-term battle with non-Hodgkin's lymphoma. The seriousness of that illness brought the now exiled Imperial couple briefly to the United States in search of medical treatment. The couple's presence in the United States further inflamed the already tense relations between Washington and the revolutionaries in Tehran. The Shah's stay in the US, although for medical purposes, became the tipping point for renewed hostilities between the two nations. 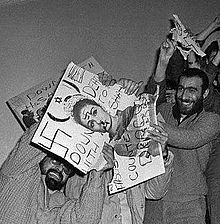 These events ultimately led to the attack and takeover of the American Embassy in Tehran in what became known as the Iran hostage crisis. By now, both the Shah and Empress viewed the Carter Administration with some antipathy in response to a lack of support and were initially pleased to leave. That attitude, however soured as speculation arose that the Panamanian Government was seeking to arrest the Shah in preparation for extradition to Iran. Under these conditions the Shah and Empress again made an appeal to President Anwar Sadat to return to Egypt (for her part Empress Farah writes that this plea was made through a conversation between herself and Jehan Sadat). Their request was granted and they returned to Egypt in March 1980, where they remained until the Shah's death four months later on 27 July 1980. After the Shah's death, the exiled Shahbanu remained in Egypt for nearly two years. She was the regent in pretence from 27 July to 31 October 1980. President Anwar Sadat gave her and her family use of Koubbeh Palace in Cairo. A few months after President Sadat's assassination in October 1981, the Shahbanu and her family left Egypt. President Ronald Reagan informed her that she was welcome in the United States. She first settled in Williamstown, Massachusetts, but later bought a home in Greenwich, Connecticut. After the death of her daughter Princess Leila in 2001, she purchased a smaller home in Potomac, Maryland, near Washington, D.C., to be closer to her son and grandchildren. Farah now divides her time between Washington, D.C., and Paris. She also makes an annual July pilgrimage to the late Shah's mausoleum at Cairo's al-Rifa'i Mosque. Farah supports charities, including the Annual Alzheimer Gala IFRAD (International Fund Raising for Alzheimer Disease) held in Paris. 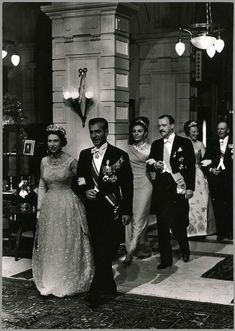 Farah Pahlavi continues to appear at certain international royal events, such as the 2004 wedding of Crown Prince Frederik of Denmark, the 2010 wedding of Prince Nikolaos of Greece and Denmark, the 2011 wedding of Albert II, Prince of Monaco and the 2016 wedding of Crown Prince Leka II of Albania. Farah Pahlavi currently has three grandchildren (granddaughters) through her son Reza Pahlavi, Crown Prince of Iran and his wife Yasmine. 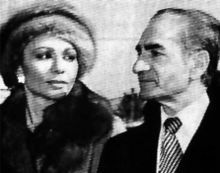 In 2003, Farah Pahlavi wrote a book about her marriage to Mohammad Reza entitled An Enduring Love: My Life with the Shah. The publication of the former Empress's memoirs attracted international interest. It was a best-seller in Europe, with excerpts appearing in news magazines and the author appearing on talk shows and in other media outlets. However, opinion about the book, which Publishers Weekly called "a candid, straightforward account" and the Washington Post called "engrossing", was mixed. Elaine Sciolino, The New York Times's Paris bureau chief, gave the book a less than flattering review, describing it as "well translated" but "full of anger and bitterness". But National Review's Reza Bayegan, an Iranian writer, praised the memoir as "abound[ing] with affection and sympathy for her countrymen." 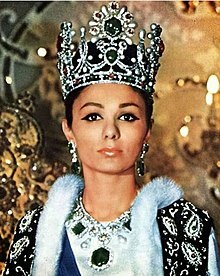 In 2009 the Persian-Swedish director Nahid Persson Sarvestani released a feature length documentary about Farah Pahlavi's life, entitled The Queen and I. The film was screened in various International film festivals such as IDFA and Sundance. In 2012 the Dutch director Kees Roorda made a theater play inspired by the life of Farah Pahlavi in exile. In the play Liz Snoijink acted as Farah Diba. ^ "Shahbanou (Documentary)". Farah Pahlavi's Official YouTube Page. 25 December 2016. Retrieved 15 January 2017. ^ The life and times of the Shah. Books.google. Retrieved 11 June 2011. ^ Afkhami, Gholam Reza. The life and times of the Shah (1 ed.). University of California Press. p. 44. ISBN 978-0-520-25328-5. ^ a b Shakibi, Zhand (2007). Revolutions and the Collapse of Monarchy: Human Agency and the Making of Revolution in France, Russia, and Iran. I.B. Tauris. p. 90. ISBN 1-84511-292-X. 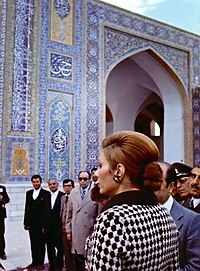 ^ "Empress Farah Pahlavi Official Site - سایت رسمی‌ شهبانو فرح پهلوی". farahpahlavi.org. ^ Meng, J. I. (29 July 2013). Translation, History and Arts: New Horizons in Asian Interdisciplinary Humanities Research. Cambridge Scholars Publishing. ISBN 9781443851176. 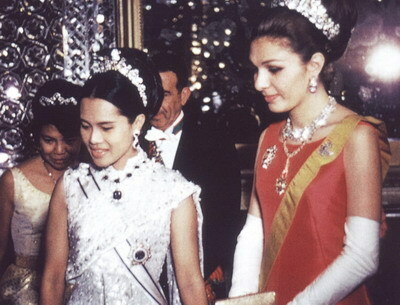 ^ "The Royal Order of Sartorial Splendor: Wedding Wednesday: Empress Farah's Gown". orderofsplendor.blogspot.com. ^ Snodgrass, Mary Ellen (17 March 2015). World Clothing and Fashion: An Encyclopedia of History, Culture, and Social Influence. Routledge. ISBN 9781317451679. ^ a b Pahlavi, Farah. 'An Enduring Love: My Life with The Shah. A Memoir', 2004. ^ Queen of Iran Accepts Divorce As Sacrifice, The New York Times, 15 March 1958, p. 4. ^ a b c d e f g Zonis, Marvin Majestic Failure The Fall of the Shah, Chicago: University of Chicago Press, 1991 page 138. ^ a b Zonis, Marvin Majestic Failure The Fall of the Shah, Chicago: University of Chicago Press, 1991 page 14. ^ Zonis, Marvin Majestic Failure The Fall of the Shah, Chicago: University of Chicago Press, 1991 page 129. ^ a b "The World: Farah: The Working Empress". Time. 4 November 1974. Retrieved 2 May 2010. ^ Zonis, Marvin Majestic Failure The Fall of the Shah, Chicago: University of Chicago Press, 1991 page 221. ^ Robert Gluck. "The Shiraz Arts Festival: Western Avant-Garde Arts in 1970s Iran". Mitpressjournals.org. Retrieved 8 January 2016. ^ Norman, Geraldine (13 December 1992). "Mysterious gifts from the East". The Independent. London. Retrieved 16 March 2012. ^ a b de Bellaigue, Christopher (7 October 2005). "Lifting the veil". The Guardian. London. Retrieved 2 May 2010. ^ a b "Iran: We Will Put American Art Treasures on Display". ABC News. 7 March 2008. Retrieved 11 June 2011. ^ "1978: Iran's PM steps down amid riots". BBC News. 5 November 1978. Retrieved 2 May 2010. ^ "Shah's Dilemma". Time Magazine. ^ "The Shah's Flight". Time Magazine. ^ "Former Iranian Crown Prince Reza Pahlavi will proclaim himself the new shah of Iran", United Press International, 17 October 1980, retrieved 25 January 2019, His Imperial Highness Reza Pahlavi, Crown Prince of Iran, will reach his constitutional majority on the 9th of Aban, 1359 (October 31, 1980). 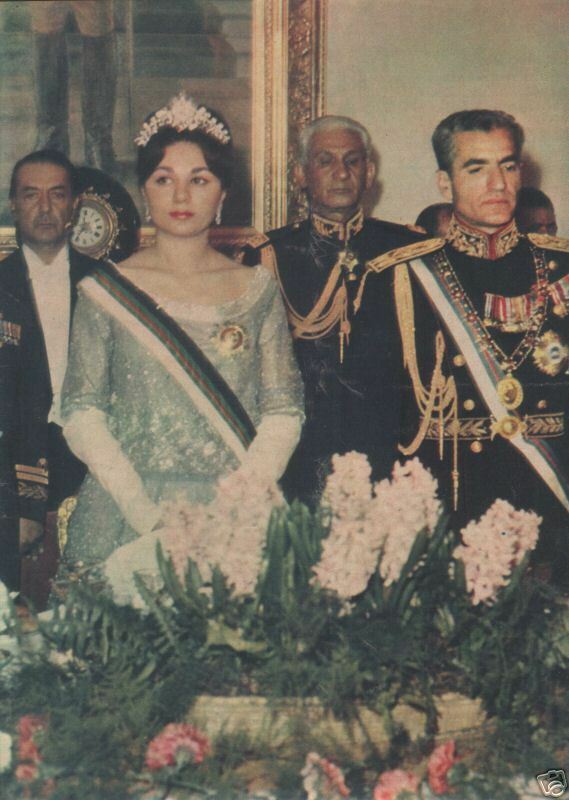 On this date, and in conformity with the Iranian Constitution, the regency of Her Imperial Majesty Farah Pahlavi, Shahbanou of Iran, will come to an end and His Imperial Highness, who on this occasion will send a message to the people of Iran, will succeed his father, His Imperial Majesty Mohammed Reza Shah Pahlavi, deceased in Cairo on Mordad 5, 1359 (July 27, 1980). ^ "Enduring Friendship: Alain Delon and Shahbanou Farah Pahlavi at annual Alzheimer Gala in Paris". Payvand. Retrieved 17 September 2012. ^ "Announcement of Birth". Reza Pahlavi. Archived from the original on 30 September 2011. Retrieved 5 August 2011. ^ Sciolino, Elaine (2 May 2004). "The Last Empress". The New York Times. ^ Bayegan, Reza (13 May 2004). "The Shah & She". National Review. ^ "The Queen and I". sundance.org. ^ "Farah Diba, World's Prettiest Woman: Premiere in Haarlem". iranian.com. 2012. 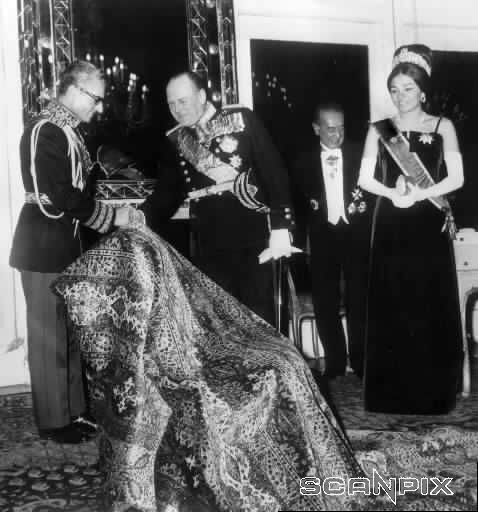 ^ a b c d e f g h i j k "pahlavi3". Royalark.net. Retrieved 8 January 2016. ^ "Photographic image". Geourdu.co. Retrieved 9 January 2016. ^ "Photographic image" (JPG). 41.media.tumblr.com. Retrieved 8 January 2016. 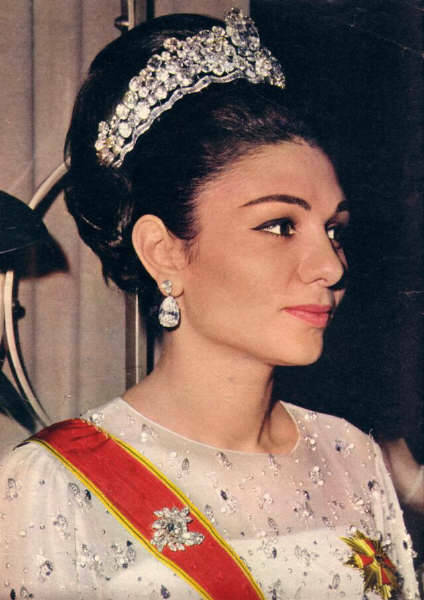 ^ "Empress Farah Pahlavi of Iran". Getty Images. Retrieved 8 January 2016. ^ "Empress Farah Pahlavi of Iran - Getty Images". archive.org. 5 March 2016. ^ "Royal and Historic Jewelry - Page 4 - the Fashion Spot". Forums.thefashionspot.com. Retrieved 8 January 2016. ^ "Reply to a parliamentary question" (PDF) (in German). p. 193. Retrieved 4 October 2012. ^ "Photographic image" (JPG). Farm2.staticflickr.com. Retrieved 9 January 2016. ^ "Photographic image" (JPG). Images.thetrumpet.com. Retrieved 9 January 2016. ^ "Muhammad Reza Shah Pahlavi of Iran". Getty Images. Retrieved 8 January 2016. ^ "Wayback Machine". archive.org. 4 March 2016. ^ "Kolana Řádu Bílého lva aneb hlavy států v řetězech". Vyznamenani.net. 25 June 2010. Retrieved 8 January 2016. ^ Ismael. "Royal State Visits: Visita de Estado de Irán a Etiopía - 1968". Royalstatevisits.blogspot.com.es. Retrieved 8 January 2016. ^ "Photographic image" (JPG). 2.bp.blogpsot.com. Retrieved 9 January 2016. ^ "The Royal Watcher : Photo". Royalwatcher.tumblr.com. Retrieved 8 January 2016. 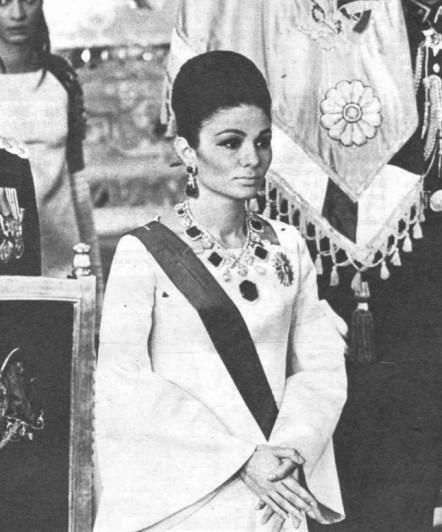 ^ "FARAH PAHLAVI S.M.I. decorato di Gran Cordone" (PDF) (in Italian). Retrieved 13 October 2012. ^ "Photographic image" (JPG). 40.media.tumblr.com. Retrieved 8 January 2016. ^ "Photographic image" (JPG). 36.media.tmblr.com. Retrieved 9 January 2016. ^ "Casa Imperial de Irán: Visita de Estado a Marruecos - 1968". Casaimperialdeiran.blogspot.co.uk. Retrieved 8 January 2016. ^ "Het geheugen van Nederland". Geheugenvannederland.nl. Retrieved 8 January 2016. ^ "Photographic image" (JPG). S-media.cache.oinimg.com. Retrieved 9 January 2016. ^ Beata (12 September 2008). "Where are our smiles from? : The Order of the Smile". Oursmiles-etwinning.blogspot.co.uk. Retrieved 8 January 2016. ^ "1lI. Otras disposicionel" (PDF). Boletín Oficial del Estado (in Spanish). 13 November 1969. Retrieved 13 October 2012. ^ "Juan Carlos I". Getty Images. Retrieved 8 January 2016. ^ "Photographic image" (JPG). Pricescope.com. Retrieved 9 January 2016. ^ "Photographic image" (JPG). Theroyalforums.com. Retrieved 8 January 2016. ^ "Casa Imperial de Irán: Visita de Estado a Túnez - 1969". Casaimperialdeiran.blogspot.co.uk. 31 August 2012. Retrieved 8 January 2016. ^ "Welcome to Flickr!". webarchive.loc.gov. ^ "Farah Pahlavi Official Site". Farahpahlavi.org. Retrieved 8 January 2016. ^ "Farah Pahlavi Official Site" (PDF). Farahpahlavi.org. Retrieved 8 January 2016. ^ "Diaries of an Exiled Persian: American University's Honorary Doctorate for Queen Farah of Persia". Exiledpersian.blogspot.co.uk. 3 January 2015. Retrieved 8 January 2016. Wikimedia Commons has media related to Farah Pahlavi.